A look back at 2016 | It`s full of stars! 2016 is history. As I have done in last year, I will use the start of a new year to look back at my private blog to see if my experiment is still on track. 2016 was the first year my blog was up and running for a full year. It feels to me like the site is running for longer than 21+ months, but the two year live mark is yet to be reached. No hardware changes occurred in 2016, the site is still running on the same Raspberry Pi 2 I migrated to in 2015. To ensure a better uptime, an APC UPS is powering the device, as well as other devices like my LibreElec powered HTPC and my RAID 5. What changed is the overall architecture. I started 2016 with a RP2 in my home, giving direct access to the web server on port 443. In march, my provider decided to block port 443 due to abnormal activities. To still be able to provide access to my site via a normal HTTP port, I decided to use a small Linux machine on AWS that will act as my public reverse proxy. Therefore, now my site is publicly available via AWS, while the content is still hosted on my local RP2. Costs for this setup? Around 6$ per month for Amazon. 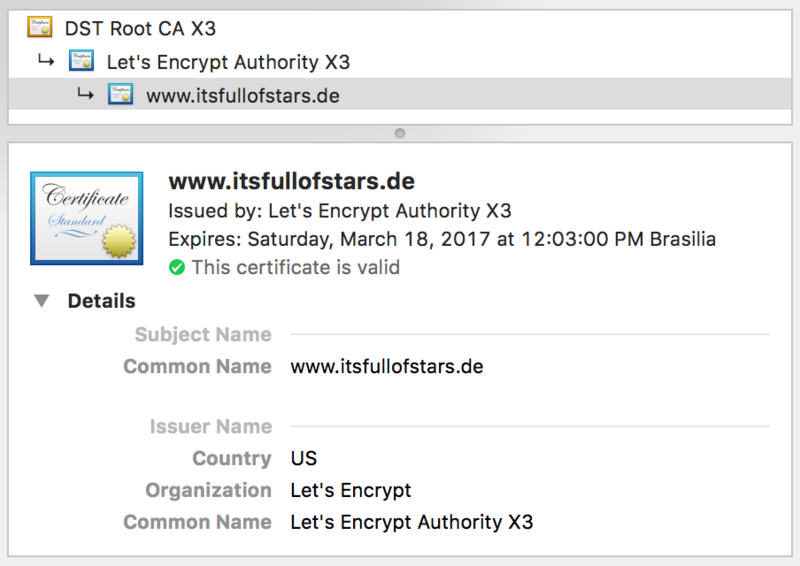 The TLS certificate was originally provided by StartSSL, but after they proved to not understand how trust works    , I switched over to letsencrypt. I consider this a change for the good: great community, easy installation process, open, high level of security for the certificate and I must change the certificate every three months. With 2016 ending, I now have 208 blogs published. 8 are still in draft mode. In 2016, I wrote and published a total of 70 blogs. I republished some old blogs I once wrote for SCN with a reference link to the original post of my at SCN. These are not part of the 70 blogs written in 2016. 70 also means 6 blogs per month. Why did I publish the old blogs again on my site? I did this mainly to regain control over my content and not to be troubled the next time the original blog content is affected by an upgrade at a site I do have no control over. I still have content at SCN that was broken in the migration in 2012 and that content is lost. I still have some blogs to convert and bring over to my site, but don`t expect too much. Most of the old content exists only at SCN and without the correct formatting, consider this content gone. At least it’s for old technology stuff, no one should be affected. To monitor the usage of my blogs I use Piwik. Version 3.0 was released at the end of 2016, but I had not the time to update my 2.x installation. The update will be done in the first weeks of 2017. 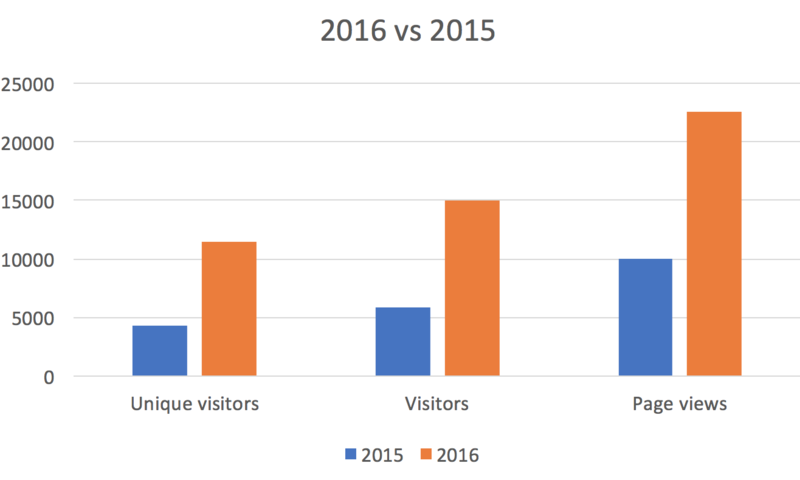 As I do not request users to log on to my site to be able to view content, the data Piwik gathers in regards to users are higher than the actual user count. If the same user access a blog via smartphone, private laptop and work computer, it will count as three unique users. I still think it gives a good overview of the usage number, as in most cases you use one device to surf the web. As most content in focused on SAP technical stuff, my main user group for sure is using the same computer (their work environment) to access my content. Piwik also does magic and can track the same user over several IPs, so when the IP of a user changes (using same browser), this user counts as one unique user. My blogs were visited by 11.441 unique visitors, in total I had 14977 visitors. This implies that most visitors come to my site once to find a solution to a SAP problem and then never come back. I guess this means their problem was solved The visitors generated 22603 page views. For a site that has only 208 blogs, and a very limited navigation, 22k page views is not bad. The usage numbers get impressive when I compare them to 2015. Short: all KPIs go up. I basically doubled the unique visitors and page views, and the number of visitors exploded. I do not think that I can perform better in 2017. An interesting chart is the page views over the last 6 months. SCN 3.0 was launched around October 2016. Guess when October starts in the below chart. While I had a significant number of users coming from SCN in 2015, this got less and less in 2016. Once given because I almost stopped blogging on SCN. But after October the referrers from SCN stopped almost completely. Now users are coming mostly from Google, or from LinkedIn when I share a blog post there. What the chart shows is that the number of page visits almost doubled “thanks” to SCN 3.0. The reported countries chart matches last year data and gives a good overview where SAP is used. Africa is close to non-existent. Same for Latin America. Argentina generated 100 page visits, Chile 73, Bolivia 7, and so on. Sum the numbers up and it’s still not half the visits I got from Brazil. From that point it makes sense to focus on Brazil for SAP related topics. 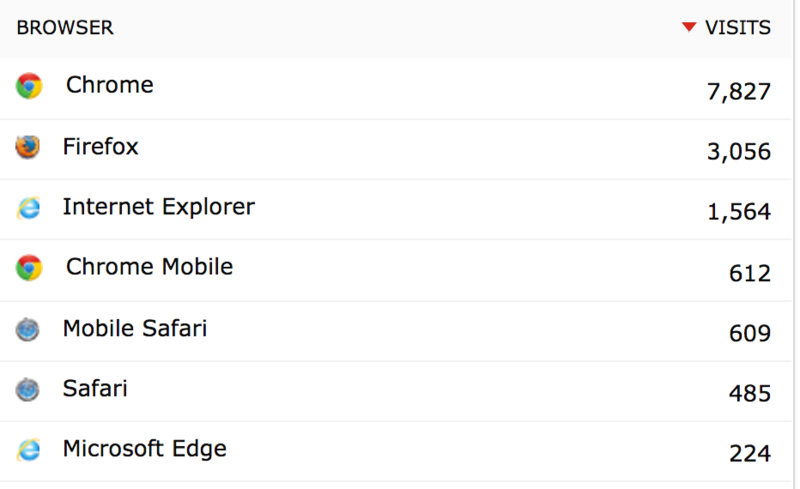 From the browser side, Chrome and Firefox lead, mobile users do exist. Not a big surprise, most content is related to work, and most people still work from a laptop / computer and not from a mobile device. This is reflected in the top 3 operating systems. Windows dominates the corporate world. Last thing to show is traffic. How much traffic is transmitted? Reminder: RP2 is in my living room, my provider is unfortunately NET, so I only get low bandwidth and an 80GB traffic limit (yes, I already tried Vivo, etc., but they do not offer cable internet at my home). To get the data out of the logs, nothing easier than Kibana. Total GB sent in 2016: almost 20 GB. Images contributed with 13 GB to this. The rest is then text, JS, CSS, etc. A total of 1.2 million requests. This ends my look back at 2016. From now on my focus is on 2017. Lets hope that 2017 is even better from the usage point of view than 2016. Some points outlined above are on my to-do list for the next weeks. For sure I must keep blogging to attract enough readers. This entry was posted in Raspberry Pi, Technology and tagged 2016. Bookmark the permalink.